A workday calendar consists of a start date, and end date, and on and off days that follow one or more defined workday patterns. 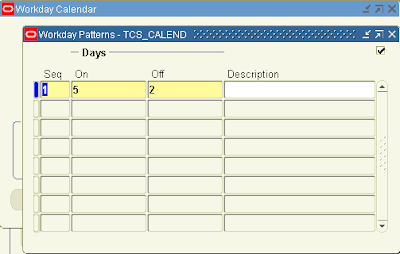 A workday calendar can also include shift information and exception dates, such as holidays or scheduled down time. Use a workday calendar for forecasting and planning material requirements, use shift information for job scheduling, and capacity analysis. 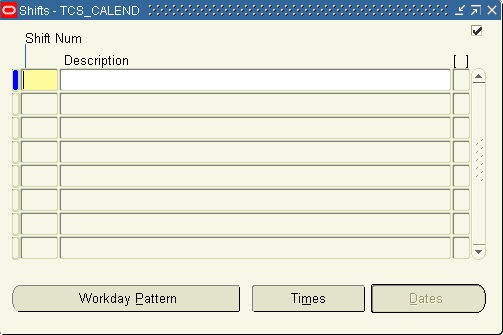 Workday exceptions identify deviations to the workday calendar. Shift exceptions identify deviations for a shift. 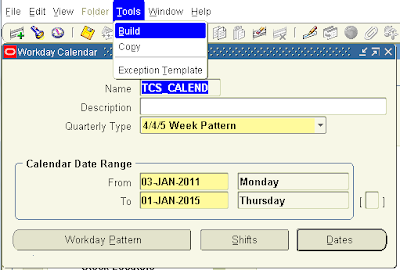 To assign workday exceptions to a workday calendar or calendar shift, either select them intuitively from the Calendar Dates (or Shift Calendar Dates) window, or apply them from an existing template, calendar, or shift. 1. Navigate to the Workday Calendar window. 2. Enter a name for the workday calendar. 4/4/5 Week Pattern: Two four-week periods followed by one five-week period. 5/4/4 Week Pattern: One five-week period followed by two four-week periods. Calendar Months: Twelve periods per year based on calendar months. 13 Periods: Thirteen four-week periods per year. 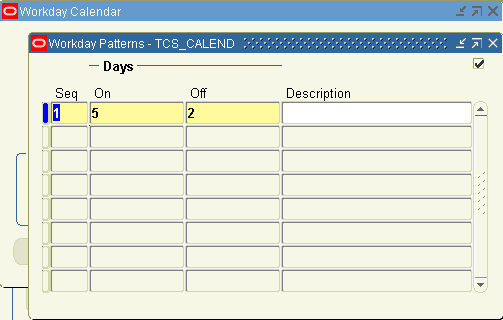 Note: If you use Oracle Master Scheduling/MRP, choose the 4/4/5 Weekly Pattern or the 5/4/4 Weekly Pattern to report MRP information in weeks and months. Otherwise, if you choose the 13 Periods calendar or Calendar Months, you can only report MRP information in monthly buckets. 4. 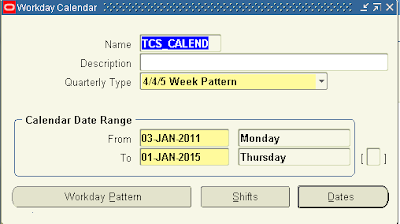 Enter a date range for the workday calendar. The default end date is four years from the start date. Note: Days on and off are calculated based on the start date and the day of the week. For example, if you want a standard five day workweek to start on 01-JAN, you must enter the start date as the Monday before 01-JAN (unless 01-JAN falls on a Monday). 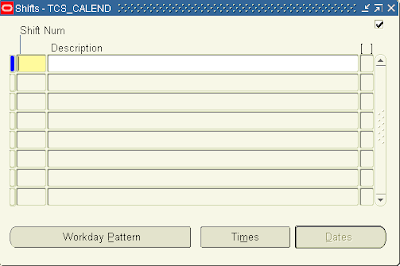 Workday Pattern: Set workdays on or off. 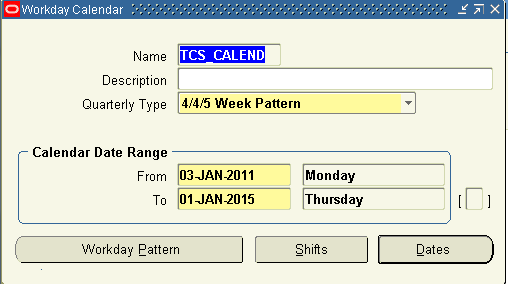 Shifts: Assign shifts to the workday calendar. Once you have created a workday pattern, assigned shifts, assigned workday and shift exceptions, and reviewed your work, you must build the calendar and assign it to an organization. 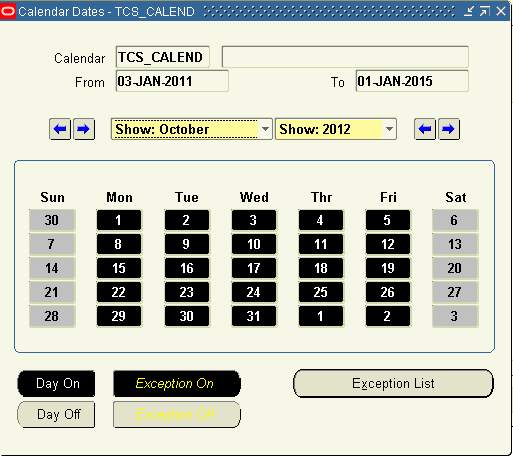 Once you have created the calendar, to make it active for using in other places, you need to build the calendar.